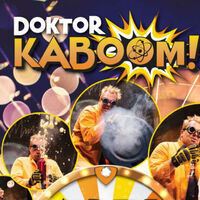 Doktor Kaboom is having trouble picking his favorite science demonstrations, so he’s bringing them all! Unfortunately, there are way too many to do them all in one show. The solution: the Wheel of Science! Doktor Kaboom has built a great big spinning wheel and labeled it with everything from optical illusions to chemical reactions to a homemade hovercraft, and more! Wherever the wheel stops, that’s what’s next! So much science, so little time. . . .